Figure 1. An example of a Revit family. The final outcome depends on your creativity: how you create and combine components, specify the right materials and assign useful parameters. Revit family modeling is a topic that can consume hundreds of pages, which this series cannot possibly cover exhaustively. Therefore, after reading this article, it is up to you to experiment and try out the Forms tools to create your own unique family. For those new to Revit, understand that the modeling tools in the Family Editor don’t employ the direct modeling technology found in other 3D programs such as SketchUp and formZ (at least not yet). 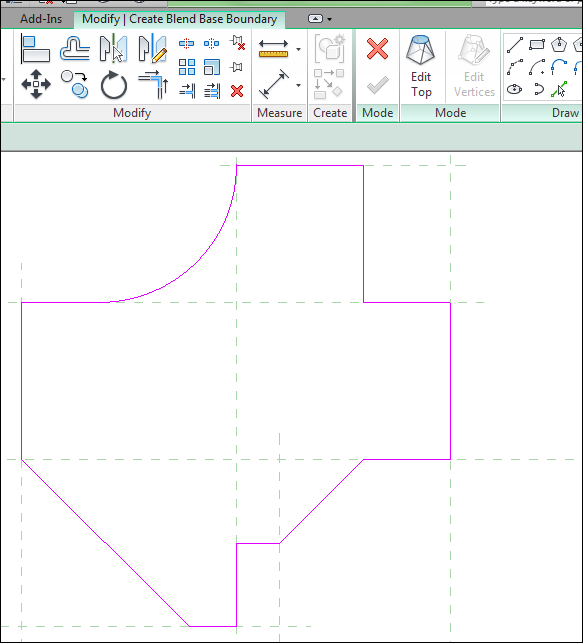 Creating shapes in Revit involves sketching profiles then specifying the thickness or path. The concept is really easy, and this article will explain this process. When you take a look at the modeling tools in the Family Editor, you’ll notice how simple they are compared to other 3D modeling programs. There are only five solid modeling tools in the Forms panel. There are also five void tools found in the Void Forms drop-down menu of the Forms panel (see Figure 2). Figure 2. The modeling tools in the Forms panel. Solid forms are the visible components you see in a family (see Figure 3). They are derived from any of the solid Forms tools. The Void Forms, on the other hand, are the invisible elements (i.e. the empty spaces such as holes or pockets) that further define a component. The creation process of voids is the same as how solid forms are created. The difference is how they interact with each other. Think of them from a Boolean perspective: Solids are additive and voids are subtractive. Figure 3. 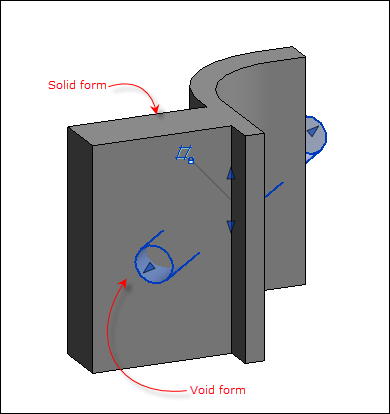 Solid and void forms. When overlapped together, voids subtract their shape from solid forms (see Figure 4). Figure 4. 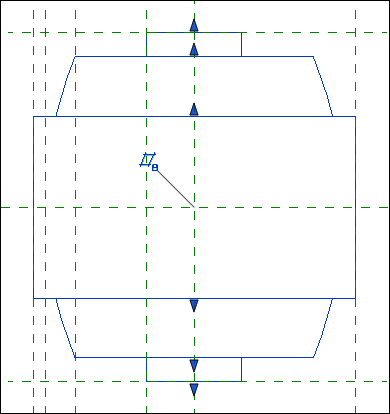 Final shape of a component after a void is subtracted. A family is simply a combination of components derived from any of the Forms tools (see Figures 5 and 6). Figure 5. Different components that make up a family. Figure 6. A family created using the Forms tools. 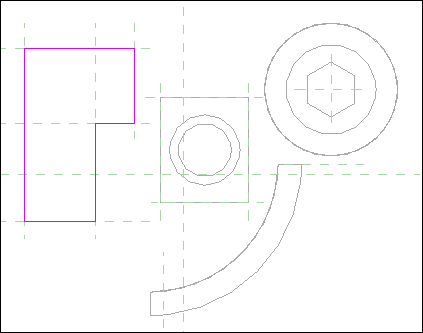 Creating components in the Family Editor begins with sketching reference planes. These are the dashed green lines that serve as guidelines when profiles are drawn. They serve as a framework in building components and creating parameters. When labeled, reference planes drive parameters (e.g. width, length, depth, etc.) 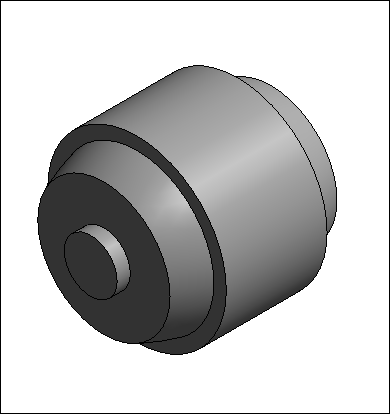 that enable a component to change its shape. Therefore, when the family is loaded in a project, users can change the properties of the family. All Forms tools require that you draw a profile. Whenever you click any of the Forms tools, you are taken into a 2D drafting environment called the sketch mode. The tab changes to a green-colored Modify tab. 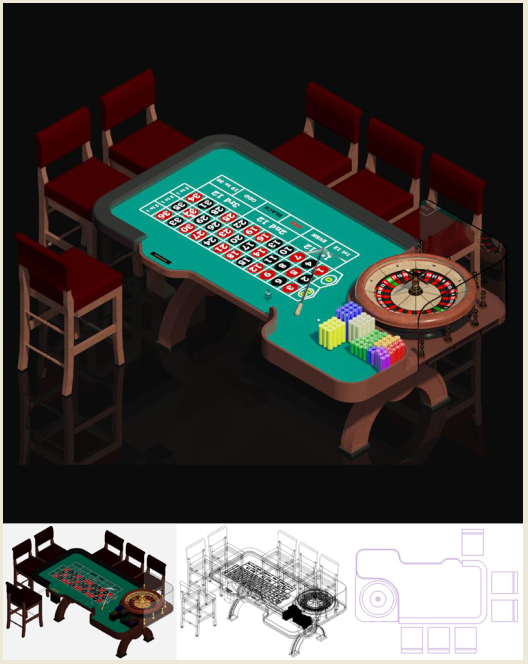 A contextual menu is also added at the far right, which, depending on the tool selected, contains the Draw and Work Plane panels (see Figure 7). Figure 7. The Forms panel and the contextual menu. 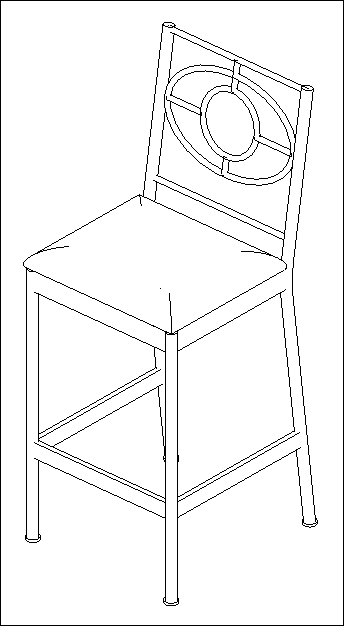 The Draw panel contains the tools for sketching a profile. 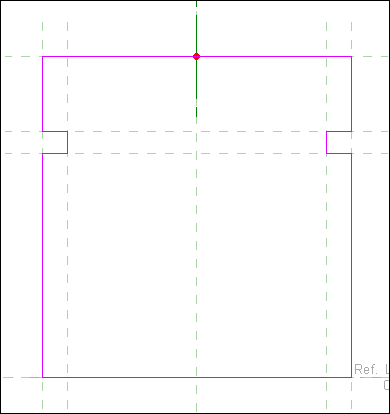 In sketch mode, sketched lines appear in magenta (see Figure 8). Figure 8. 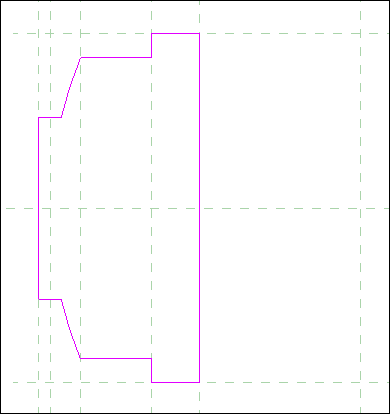 Sketched lines in sketch mode appear in magenta. 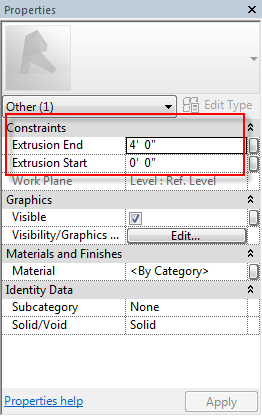 The Extrusion tool creates a component based on a sketched profile (see Figure 9) and its thickness, as specified in the Constraints option of the Properties palette, which controls how the extrusion is projected (see Figure 10). Figure 9. A sketched profile. Figure 10. The Constraints option. 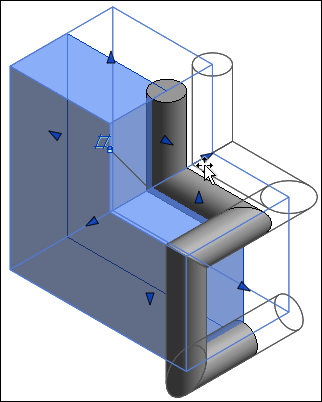 After clicking the Finish Edit Mode button (the green check mark) from the contextual menu (see Figure 11), the extrusion component is created (see Figure 12). Figure 11. The Finish Edit Mode button. Figure 12. 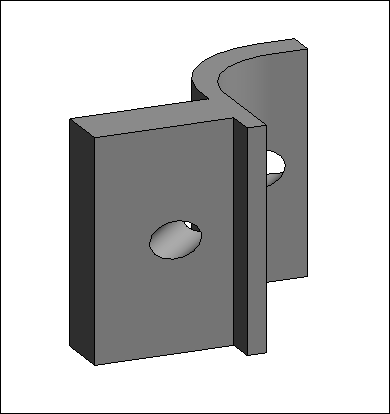 Examples of extrusion components. A sketched profile must be a closed loop. More than one closed loop profile can be sketched. The thickness is always perpendicular to the sketched profile. The Blend tool blends or combines two separate profiles/boundaries. It is based on the work plane and, just like extrusions, requires a thickness from the Properties palette to create a component. When the Blend tool is selected, the process begins with creating a profile from the base of the component (see Figure 13). Figure 13. 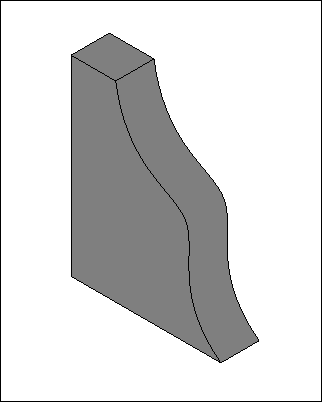 A sketched base boundary. The next step is to click the Edit Top button from the Mode panel to create the second sketch profile (see Figure 14). Figure 14. A sketched top boundary. 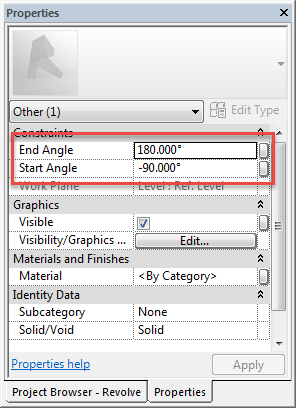 After specifying the height and clicking the Finish Edit Mode button, the blend is created (see Figures 15 and 16). Figure 15. The finished blend component in plan view. Figure 16. The finished blend component in 3D view. When sketching profiles, only one closed loop is allowed. The Revolve tool creates a shape by revolving a profile along an axis line. 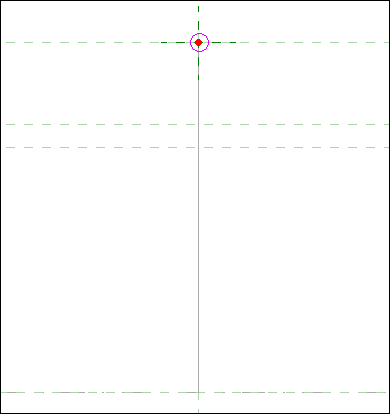 The amount of the shape’s rotation along the axis defaults to 360°. 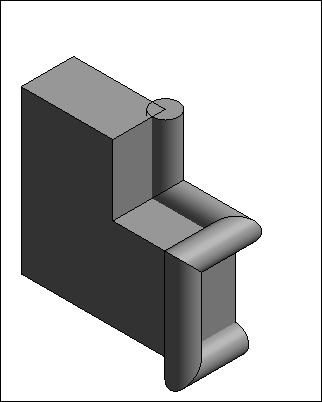 After the Revolve tool is clicked, the boundary tool is selected by default (see Figure 17). Figure 17. The Boundary Line tool. You then start the revolve process by sketching the boundary, which is half of the revolve profile (see Figure 18). Figure 18. 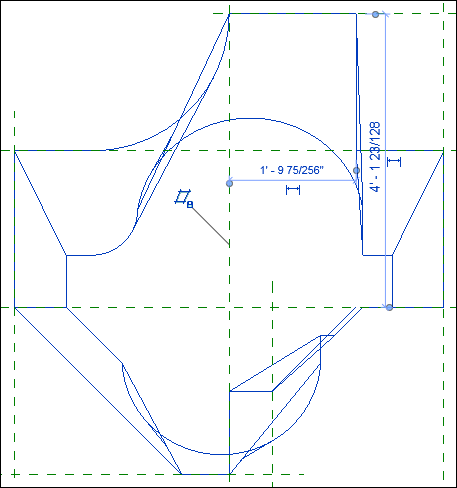 A sketched revolve profile. 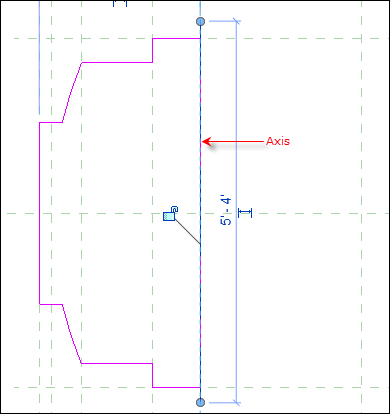 After sketching a closed loop profile, you then draw the axis using the Axis Line tool from the Draw panel of the contextual menu (see Figure 19). Figure 19. The sketched axis line. Finally, click the Finish Edit Mode button, and the revolve component is created (see Figures 20 and 21). Figure 20. The finished revolve form in plan view. Figure 21. The finished revolve form in 3D view. 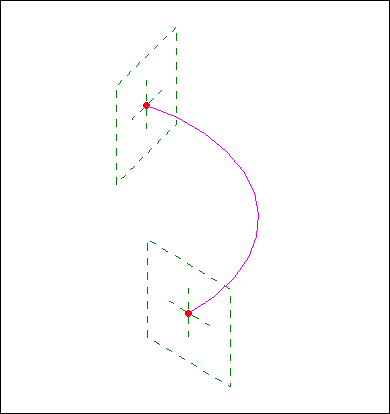 Revolve Angles: Specific Start Angle and End Angle can be specified in the Properties palette (see Figure 22). Figure 22. 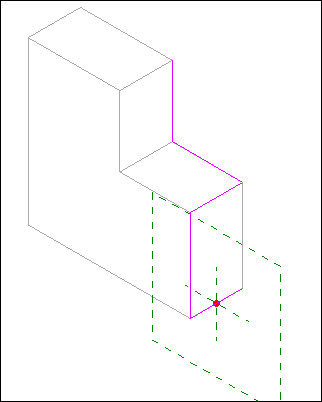 The angle constraints in the Properties palette. 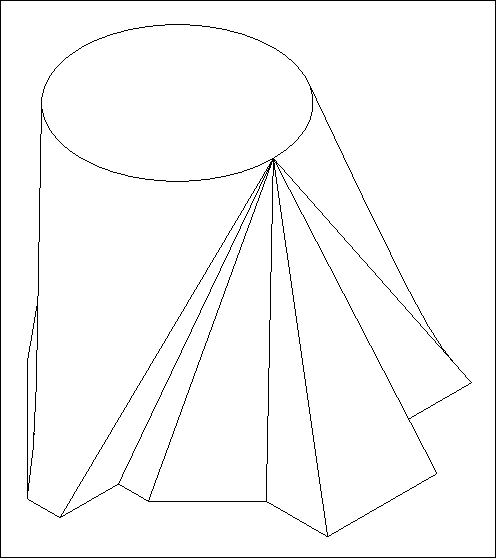 This creates a pie-like shape suitable for illustrations such as section cuts (see Figure 23). Figure 23. 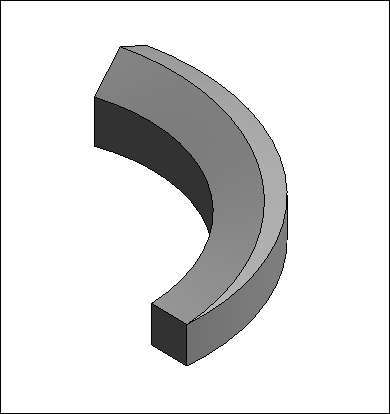 A revolve applied with specific rotation angles. 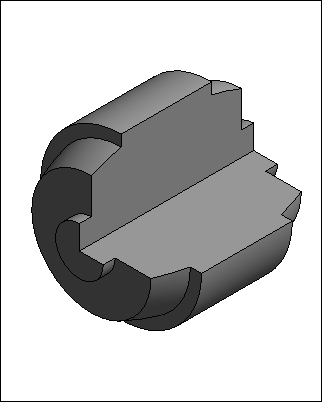 The Sweep tool is a type of extrusion with thickness that follows an open or closed loop path. Think of crown molding that follows the top edges of walls in a room. When the tool is selected, the first step is to create a path. In this mode, there are two methods of doing this, Sketch Path or Pick Path (see Figure 24). Figure 24. Two methods of sketching sweep paths. 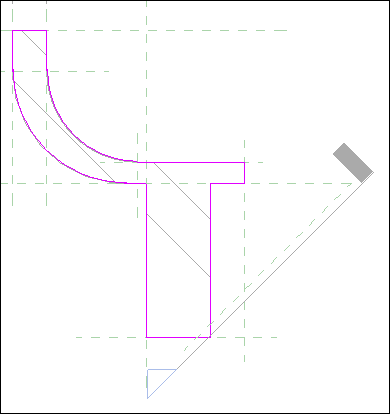 In this sweep example, we’ll select the Sketch Path method and draw a profile from the front view elevation (see Figure 25). The work plane defaults to the center (front/back). Figure 25. 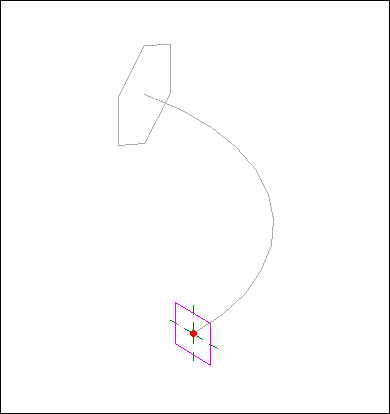 A sweep path drawn using the Sketch Path method. After clicking the Finish Edit Mode check mark, click the Edit Profile button from the Sweep panel (see Figure 26). Figure 26. The Edit Profile button. Note: The Select Profile button is a sweep option that allows you to select pre-drawn profiles. This method is a time saver if you will be using a profile that will be reused in other parts of the family. It is created using the Profile template. When loaded in the family, it appears under the Profile drop-down list (see Figure 27). Figure 27. The Profile drop-down list. The Go To View dialog box will pop up, prompting you to select a view from which to create the profile (see Figure 28). Figure 28. The Go To View dialog box. 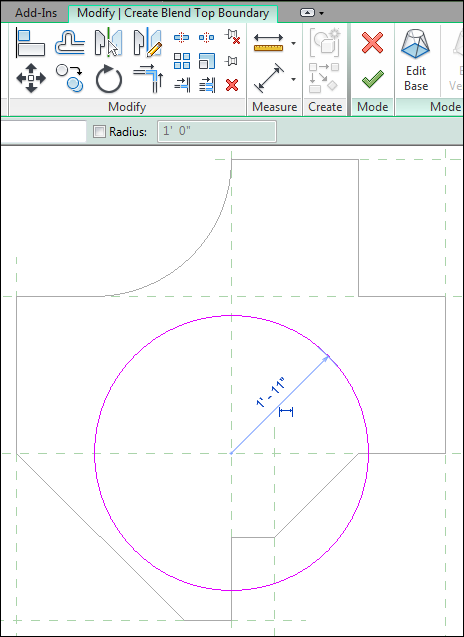 Draw a circular profile, and then click the Finish Edit Mode green check mark. The sweep is created (see Figures 29 and 30). Figure 29. 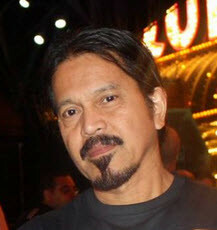 The sketched profile. Figure 30. The finished sweep component. 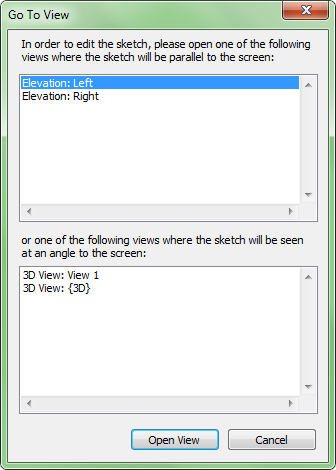 Click the Default 3D View button from the Quick Access Toolbar to view the sweep in 3D (see Figure 31). Figure 31. 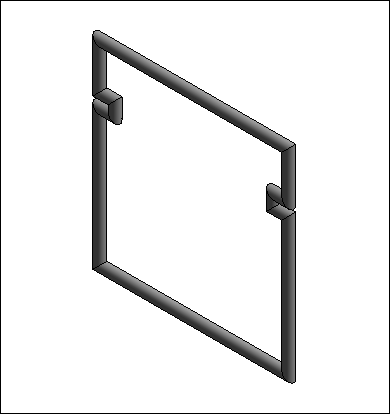 The finished sweep component in 3D view. Pick Path: This is a sweep option that automatically creates a path when an edge is selected. This includes edges of solid geometry such as extrusions and blends as well as reference and model lines. 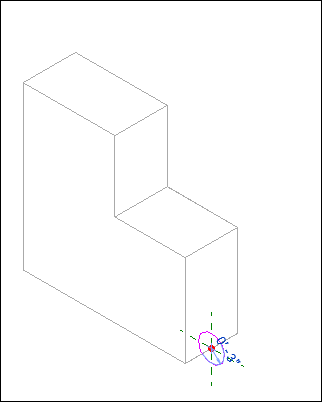 In this method of path creation, the sketched line is automatically locked to the selected edge. Therefore, when the geometry changes, the sweep updates. 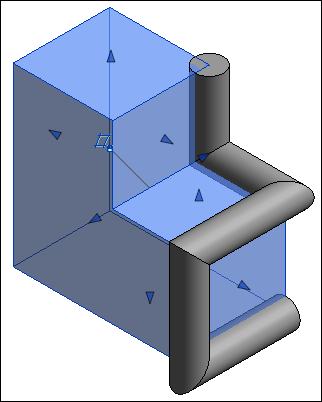 Using the extrusion shown in Figure 32, five edges are selected as the sweep path (see Figure 33). 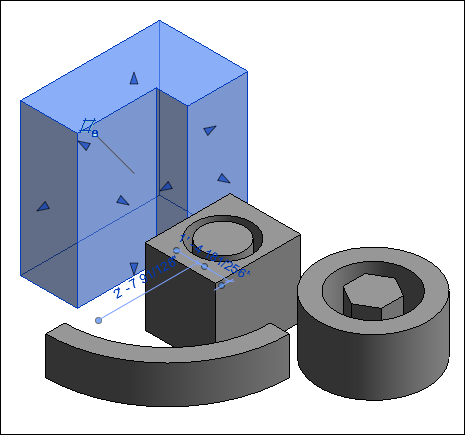 After clicking the Finish Edit Mode button, a circular profile is sketched (see Figure 34). After clicking the Finish Edit Mode once again, the sweep is created (see Figure 35). 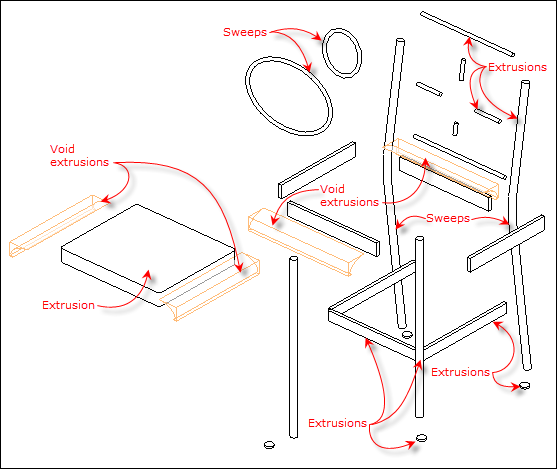 Now when the extrusion is selected and stretched (see Figure 36), the sweep changes to conform to the new path (see Figure 37). Figure 33. 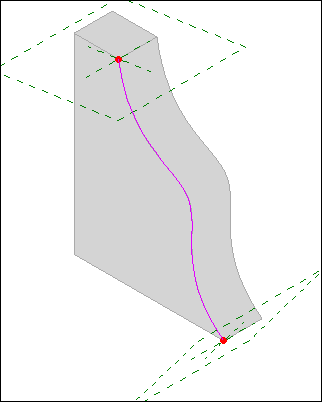 Selected edges as sweep path. Figure 36. Selecting and stretching extrusion. Figure 37. 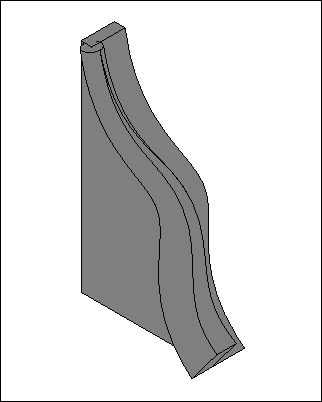 Extrusion adapted to sweep. A path can be an open or closed loop. The Swept Blend tool combines the function of the Sweep and Blend tools. However, the path can only consist of one segment (see Figure 38). 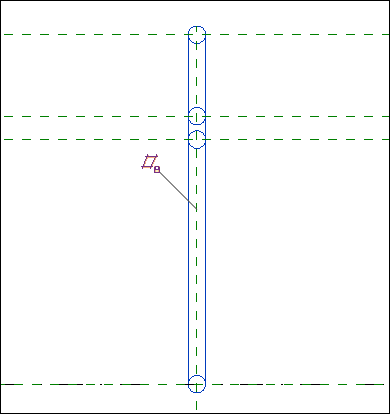 Like the blend tool, a profile is sketched at both ends of the path (see Figure 39). Figure 38. The sketched path. Figure 39. The sketched profiles. The profiles can be selected by clicking either the Profile 1 or Profile 2 buttons in the Swept Blend panel (see Figure 40). Figure 40. The Swept Blend panel. 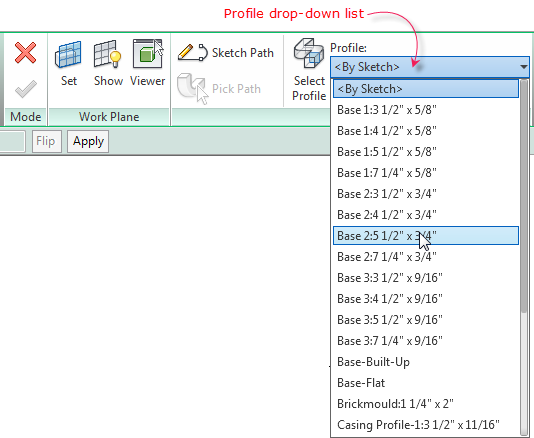 Note: Just like the Sweep tool, predrawn profiles can be created and loaded in the family where it shows up in the Profile drop-down list of the Swept Blend panel. 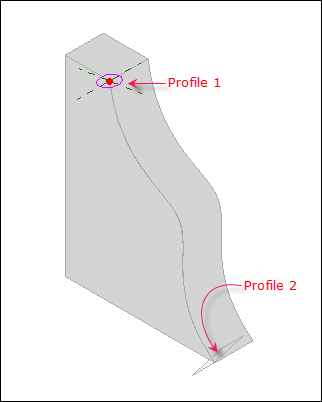 After the profiles are created and the Finish Edit Mode button is clicked, the blended profiles create a complex component (see Figure 41). Figure 41. The finished swept blend component. Using the extrusion shown in Figure 42, an edge is selected as the sweep path (see Figure 43). After clicking the Finish Edit Mode button, Profiles 1 and 2 are sketched (see Figure 44). After clicking the Finish Edit Mode once again, the sweep is created (see Figure 45). 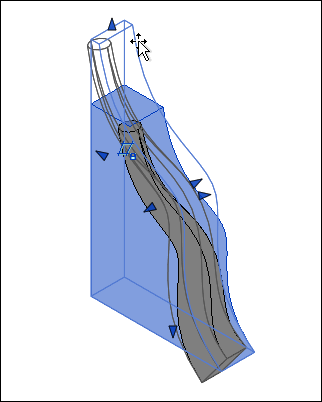 Now when the extrusion is selected and stretched (see Figure 46), the swept blend changes to conform to the new path (see Figure 47). Figure 43. Sweep path selected. Figure 44. Sweep created. Figure 45. Generated sweep. Figure 46. Extrusion selected and stretched. Figure 47. Swept blend conforms to new path. A path can only consist of one segment. 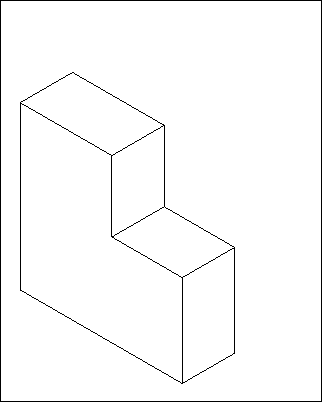 The path can be a straight or curved segment. The profiles don’t have to be parallel to one another either. That’s all there is on how to build shaped components to create unique and realistic looking Revit families. Try out all these tools in your spare time. Start with simple furniture or objects in your house or office. Then apply the techniques explained in the previous articles of this series. It will now be easier for you to grasp the concepts of creating parameters in the upcoming second part of this important topic.